Make sure the area you are going to tile is level, clean and free of grease. Apply the tiles to the wall with tile adhesive, starting in the bottom-left corner. Work along the bottom row, placing tile spacers between the tiles. Once you have tiles the first line, use a spirit level to check the tiles are straight and even. Repeat the process until you have covered the area you are tiling. If your tiles don't fit exactly you will need to cut them to size using a tile cutter. Leave the tile adhesive to dry for 24 hours, then remove the tile spacers and apply grout, carefully working on one tile at a time. 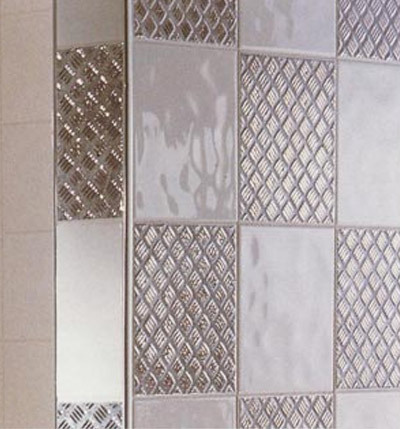 Wipe over the tiles with a damp cloth to remove any excess grout and leave to dry. What you need: sandpaper, water-resistant tile adhesive, silver or aluminium tiles, tile spacers, spirit level, tile cutter, tile grout, clean-damp cloth.